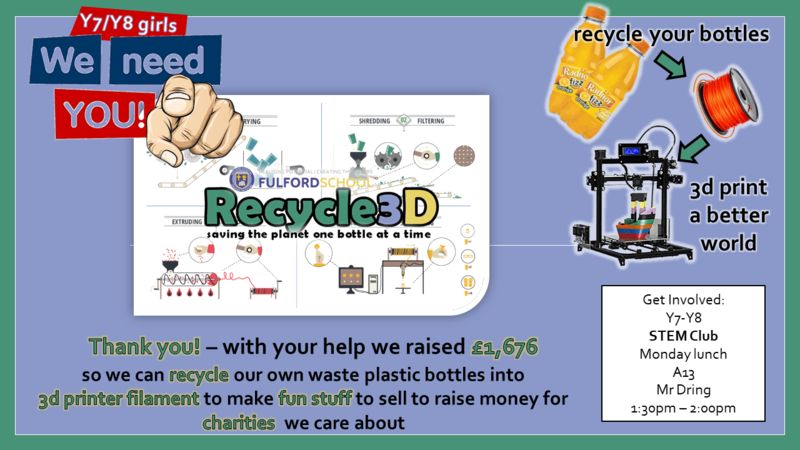 Back in March this year, Fulford School STEM club launched Recycle 3D: a crowd-funding project to start turning waste plastic drinking bottles into 3d printed artwork. Recycle3D STEM Club poster to recruit more Y7 and Y8 girls. The kit has now arrived and so in yesterday’s STEM club we started assembling the 3d filament extruder. Please note: photos of students are only included here if students and parents have given consent. Please contact me if you have any questions or concerns. Before we tried the extruder with shredded plastic drinks bottles we wanted to try it out with some ABS plastic pellets that came with the Noztek Pro. Results were positive: the ABS plastic pellets we used had a melting point of between 195 and 200 degrees Celsius so we set the temperature to 197 degrees. Before long, a steady stream of plastic was coming out of the nozzle. Sadly, the Noztek Pro doesn’t come with a spool to collect the filament. 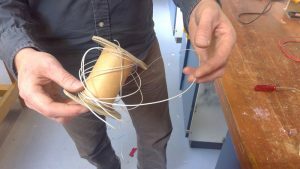 We used a spare wire spool to wind the plastic filament around, but we found that turning the spool at slightly different speeds affected the thickness of the filament. The Noztek Pro is a great piece of kit that works well, at least with small ABS pellets. 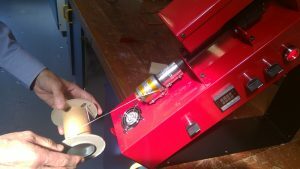 We could do with a spool that turned slowly to collect all of the filament that is extruded. A speed adjustable stepper motor rigged up to an old 3d printer filament spool and mounted to the end of the Noztek Pro would be idea. 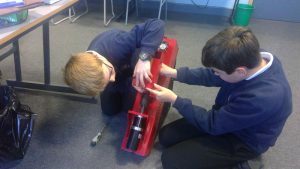 The students who come along to STEM club are brilliant – really keen and motivated. We currently have loads more boys than girls. Part of the reason for establishing STEM club was to recruit more girls into Computer Science and Design & Technology so I want to get form tutors involved in recruiting girls who might be interested in getting involved.